Indexes are very effective at helping readers find something specific in a book. Almost any nonfiction book will have an index. It’s important that you as a reader know how to use an index, so you can find things quickly. 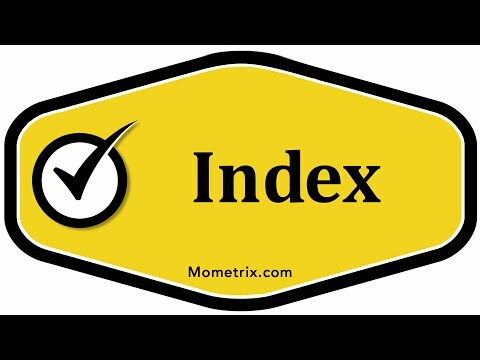 This is what an index might look like. We’ll have everything here classified in alphabetical order. Notice, nothing here is classified by page number. Everything is in alphabetical order. Many times, there will be a big letter A, a big letter B, and a big letter C as you progress through the alphabet, then everything that falls under A, B, or C will be under that big letter. The first entry says “John Adams”. Notice that “Adams” comes first; it says “Adams, John”. That’s because anytime a name is in an index, the last name will come first. Out to the right of “Adams, John” we have the page number that you can find John Adams on (35-42). All of those pages through there, 35, 36, 37, 38, 39, 40, 41, and page 42 all have John Adams on there, as well as page 53. If you look at “apple”, apple only appears on page 3. Now we’re moving down to B. “Buchanan, John”. There are a lot of things about John Buchanan, so if all of these page numbers over here were listed, it would be difficult for the reader to find specifically what they are looking for. John Buchanan is further broken up into “achievements of”, “death of”, and “life of”. What you do here is you take “achievements of” and insert it right before the main title, and you take “death of” and insert it right before “Buchanan, John”. If you’re wondering why it says “of” at the end, that’s because it’s supposed to read “achievements of Buchanan, John; death of Buchanan, John; and life of Buchanan, John”. If you’re looking for the achievements of John Buchanan, look for pages 42-44. If you’re looking for the death of him, look on page 46. If you’re looking for the life in general of John Buchanan, look at pages 39-46. Now, I want to show you another example. Imagine we get all the way to R, and R has “red apples” on it. Someone is looking specifically for red apples. Instead of having the page number here, it might just say “see apple” in parentheses. That means you would go up here and find “apple”, and you see “apple” is on page 3. Maybe on page 3 it talks about lots of different types of apples. It would be pointless to have “red apples”, “blue apples”, “green apples”, and “purple apples” with “page 3” next to it. Instead, it just says “see apple” under it. Whoever wrote the index knew that someone might specifically look for red apple, so they still put it in here. You’re just going to refer back over here to find which page number it is on. The important thing to remember with indexes is that everything is going to be an alphabetical order. Page numbers no longer matter. If you’re looking for a name, the last name is going to be put in there first.